Organise a retreat or pilgrimage for this year. It may be a visit to a pilgrimage place, spoken or silent retreat. Retreat helps to refresh your spirit and pilgrimage helps to gain extra graces. Record good things what happen to you day after day. Soon you will realise how fortunate and blessed you are! 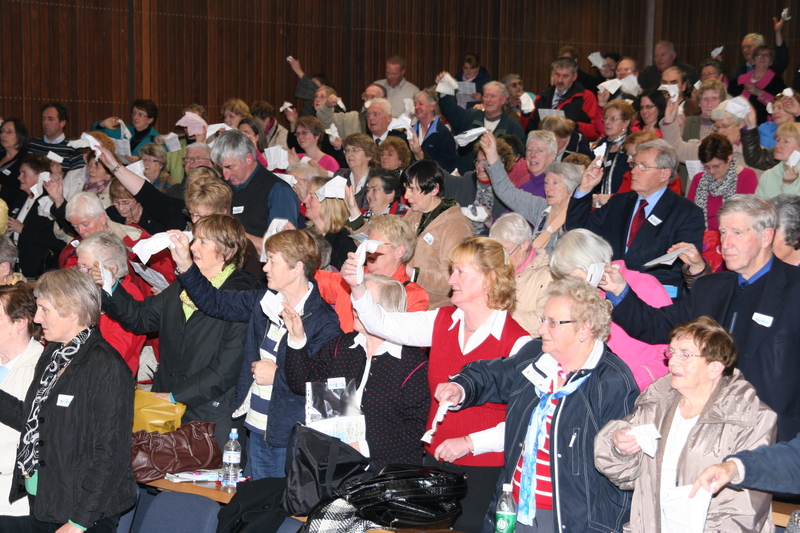 The National Fatima Conference took place in University College Cork on 30th October 2010 in Boole No.4. The conference theme “Lead All Souls to Heaven” was a direct response to Pope Benedict’s letter to the Irish people to pray, meditate and repent and follow the word of God and His commandments. It was a full day event starting at 10am and finishing at 5pm. 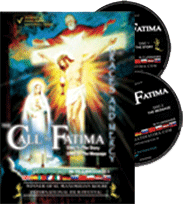 The organisers The Call to Fatima team who produced the double award film documentaries based entirely on Sr Lucia’s writings has the approval of the Fatima Shrine, Carmel of Coimbra and supported by the Vatican. The conference was free admission with prior booking requirements and free car park space was made available. The conference was attended by 400 people from county Cork, Co. Limerick, Co. Meath, Co. Roscommon, Co. Mayo, Dublin, Co. Kerry, Co. Kildare, Belfast, Co. Kilkenny, Co. Wicklow, Co. Waterford, Co. Tipperary, as well as people from England, Australia, Latvia and Slovakia. 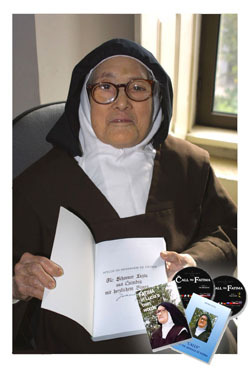 A special free gift packages was presented to every person at the entrance, which included the hymn sheet, prayer sheet to Blessed Jacinta and Francisco, Sister Lucia and to the Most Holy Trinity + the Five First Saturday devotion, the Brown Scapular, the Rosary Beads, pencil and a white napkin for the Farewell song in honour of Our Lady (Fatima tradition). The Catholic Voice provided 400 free newspapers. Speakers: Fr Michael Maher SM spoke about the obedience and to follow the Pope and the Church during these hard times. Sister Angela Coelho, Vice Postulator for the Blessed Jacinta and Blessed Francisco’s cause spoke in detail about the two little shepherds before and after the apparitions of Our Lady, as well as their characters and concerns during their life. The second talk of Sr Angela was on the devotion to the Five First Saturdays, as Our Lady requested to Sister Lucia in 1925. Thomas McCormack, the producer/ director of the film “The Call to Fatima” spoke about the Message of Fatima in reference to his film and Sister Lucia’s last book “Calls from the Message of Fatima”. All talks were exciting and very inspiring, according to many people who came and expressed their thoughts. The day started with the Rosary, following talks, followed by the Angelus and the Brown Scapular enrolment by Fr Michael Maher. Father beforehand explained the meaning/ history and importance of this sacramental. The conference atmosphere was created by the beautiful singing of soprano Louise Irvine and her brother on keyboard Christopher Irvine, involving all in Fatima and Marian hymns. The stage was enriched by Our Lady’s statue and the statues of 3 little shepherds brought from Co. Kerry by John and Patricia Heaphey. Faithful could also participate in the Eucharistic Adoration, that was available all day in a special room. 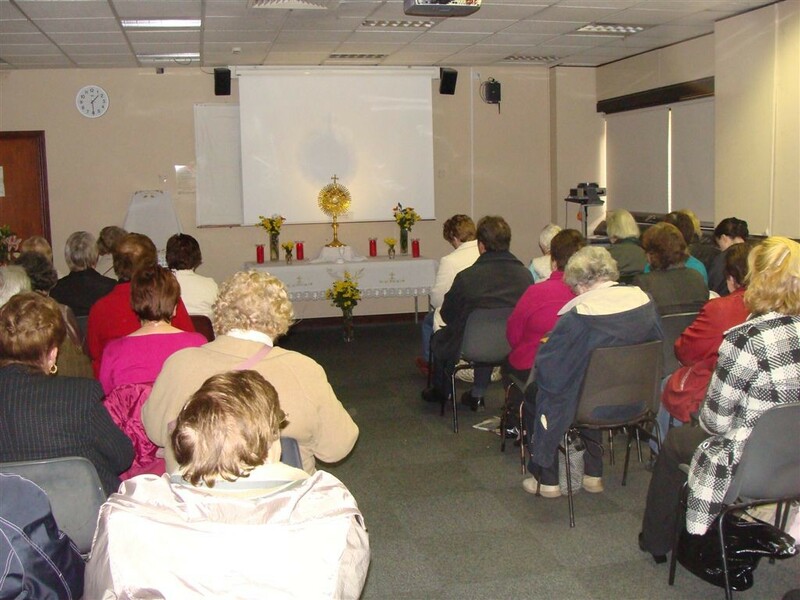 The Eucharistic Adoration was organised and supported by Perpetual Adoration Group, who carry out such work all over Ireland by John Howard and his team of dedicated supporters. A special Fatima gallery of 150 A4 photographs was displayed for the students and visitors for the first time upon entrance. 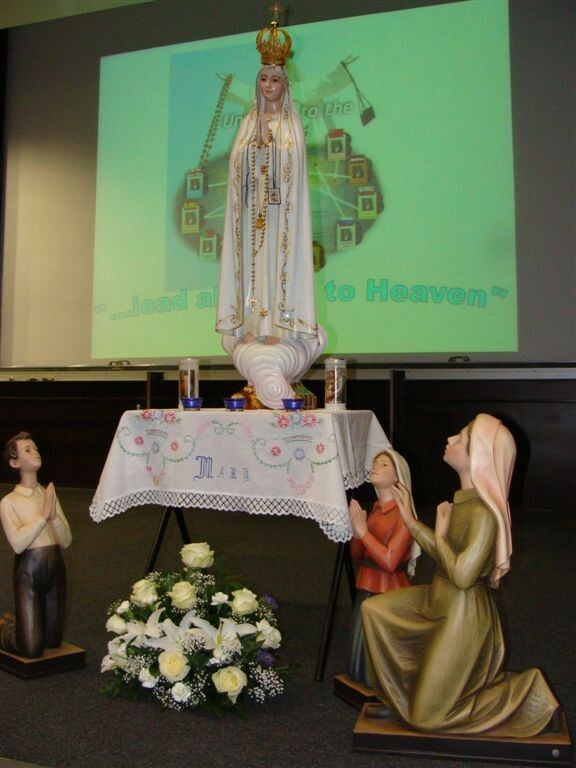 The National Fatima Conference had a coverage in the Catholic Voice and The Universe in England. The conference’s break was between 12.30pm and 2pm for lunch, Confessions and Adoration. 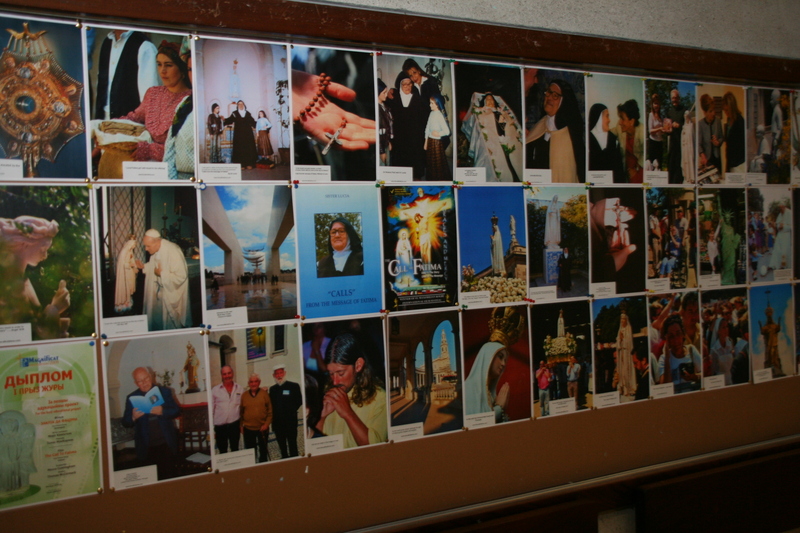 “How to make a Good Confession” leaflets were displayed at the entrance to the Confessions room. 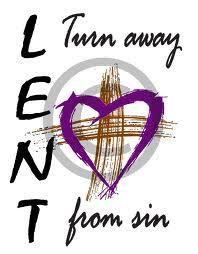 Many people used a great opportunity once again to reconcile with Our Lord. The day was supported by volunteers, who guided people to their seats, helped with the registration and handout material. 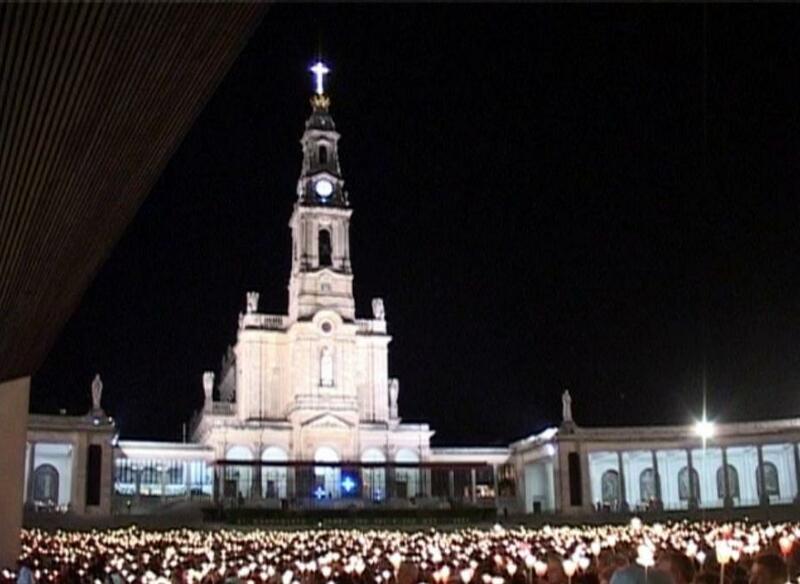 The Fatima Conference concluded with the Holy Mass, which was the highlight of the day. Before the Holy Mass Fr Michael Maher brought the Most Holy Sacrament to the conference hall for the 30 minutes Eucharistic Blessing. The Franciscan brothers of the Most Holy Trinity Church helped to set up the Mass requirements and provided the altar cloths, chalices, wine and hosts for the Mass. During the Mass everyone was consecrated to the Immaculate Heart of Mary, entrusting themselves to her guidance and care. 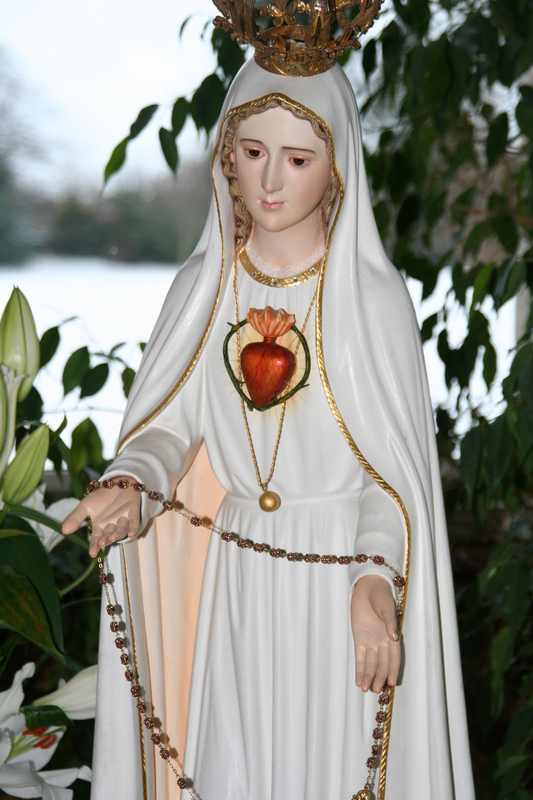 This act of consecration was lead by Father Maher to renewed devotion to the Immaculate Heart of Mary. An the end of the Mass the faithful were waiving goodbye to Our Lady with their white napkins singing the hymn “O Fatima, Farewell!” After the National Fatima Conference, people were inquiring about the next venue to bring this conference to various Dioceses in 2011. Mehmet Ali Ağca, who shot Pope John Paul II, wants to attend annual ceremonies at Portugal’s Fatima shrine and meet with Pope Benedict XVI, who is also scheduled to attend, his lawyer said on Thursday. Lawyer Hacı Ali Özhan told the Associated Press he has written to Portugal’s president and prime minister seeking permission for Ağca to travel there for the May 13 event. A letter was also sent to the Vatican, requesting a meeting between Benedict and Ağca at Fatima, Özhan said. Neither Lisbon or the Vatican have replied to the March 16 letters, which were made available to the AP. Ağca was released from prison in January after completing a sentence for the 1979 killing of Turkish newspaper editor Abdi İpekçi. Ağca shot John Paul II on May 13, 1981, as the pope rode in an open car in St. Peter’s Square, during a period in which he had escaped from prison. The pontiff was hit in the abdomen, left hand and right arm. The motive for the attack remains a mystery. Book “Calls from the Message of Fatima” is easy to read on account of the coherence and simplicity of the themes discussed and their applications. Lucia is thus seen to be in full harmony with the faith of the Church and with the faith of simple people. This book runs parallel to the profound theological demands of the Christian life and also the vital breath of a popular, Christological and Marian piety, which is both simple and universal. Sister Lucia reveals one of the most authentic qualities of true Marian piety: coherence with the Gospel, a profound ecclesial sense, the universality of the Christian message. She also wrote this book in the ability to dedicate both mind and heart, the realistic approach to the problems of life and death, of day-to-day life and the most authentic experiences which have as their point of reference the last realitie escatology: Purgatory, Hell, Heaven. Many important and original things are woven into Lucia’s book. It reveals Mary’s commandment.